This is the first article of a new series I'm writing called the "Before you..." series. The goal of the series is to write reminders of things to check for before buying a stock, selling a stock, or altering one's investment strategy. 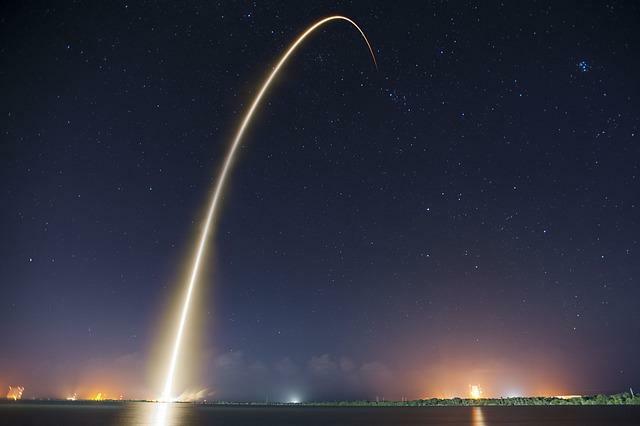 This article focuses on super-cycles, different types, how to identify them, and a few investment strategies regarding how to eventually invest after they have occurred. This article is the first of a new series I plan to write called the "Before you..." series. I've noticed that a lot of writings on SA have become more sophisticated and technical over the past couple of years (and I think that's a good thing). But I worry that new readers and newer investors coming to the site to share ideas about investing might be a little overwhelmed at first. I specialize in cyclical investing and rotational strategies, and I know that my own investing strategy has become more intricate and sophisticated over the years. And again, I think that's a good thing. But it can be hard to discuss some of the basic assumptions I'm making about my investment ideas and strategies in a 2,500-word article, while also getting the specific analysis I want to highlight in the articles as well. So, the "Before you..." series is intended to take one small piece of what I look at before making an individual investment, or before making adjustments to my overall investing strategy, and sharing my thoughts on that subject in a series of (hopefully) concise articles. While the "Before you..." titles may be interpreted by readers as being directed at them, I want to note that they are equally directed at me, as a series of reminders of the lessons I've learned on my investing journey. I don't expect everyone to agree with each article, but each article should at least offer something to think about. My basic approach to investing is a value approach, mixed with a little bit of growth-at-a-reasonable-price approach. Someone with a very different approach might not find my thoughts on various issues useful. That's fine. I think there are many good strategies out there. But my focus is on cyclical value and medium-term rotational portfolio strategies, so these articles will all broadly be from that perspective. Checking for Super-cycles. What are they? One of the hardest parts about defining a super-cycle is deciding what it means for a stock to have experienced a super-cycle. I think the simplest understanding is that a super-cycle is a cycle that is bigger than most previous cycles. I think there are three main aspects to a super-cycle: time, sentiment, and earnings. With regard to time, I think one way to consider something a super-cycle is that it can be a very long cycle that often isn't identified as a cycle at all by most investors because of the amount of time it takes to play out. Take the cycle in the rates of short-term Treasuries. This cycle is so long that even going back 40 years, we can just barely start to capture it on this chart. We really need to go back to the 1920s and 1930s to see the ebb and flow over time. 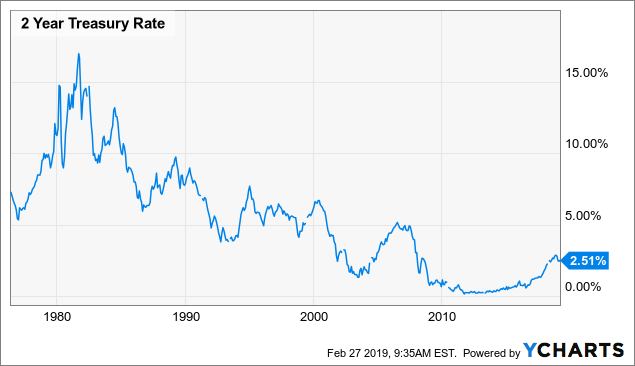 I think it's fair to call the interest rates in, say, 1981 the top, and in 2011 the bottom of a super-cycle (or at least the beginning of the bottom of one). Some cycles are very long like this, and in those cases, time itself becomes part of what makes the cycle "super". But, for most cycles that I look at, I think of time as working in the opposite way. I think of big moves in earnings and in sentiment that occur over short periods of time to be what makes a cycle "super" most of the time. 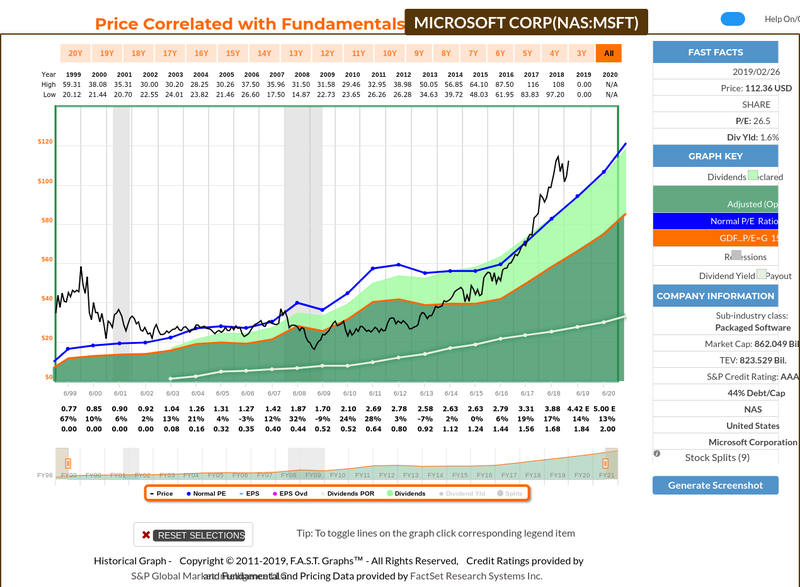 For example, let's look at Microsoft (MSFT). 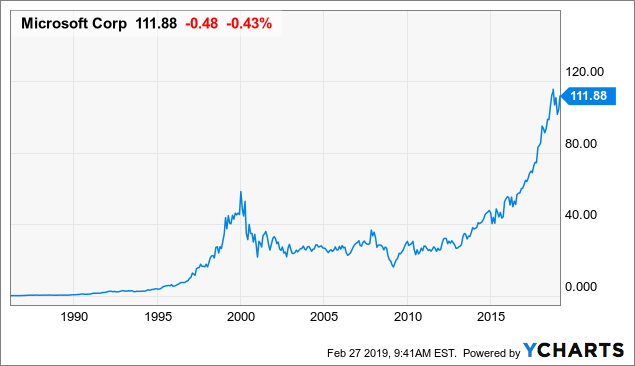 We are probably all aware of the dot.com bubble that occurred in the late 1990s. 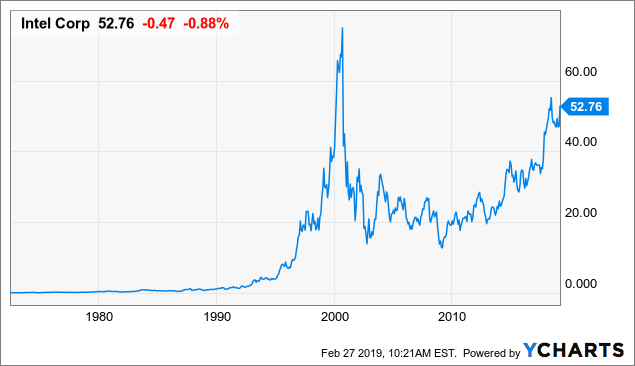 While many of the companies that drove up the price of the market were worthless, that was certainly not the case with Microsoft. It was a very valuable company that actually earned shareholders money. But sometimes, sentiment can drive a medium-term super-cycle. 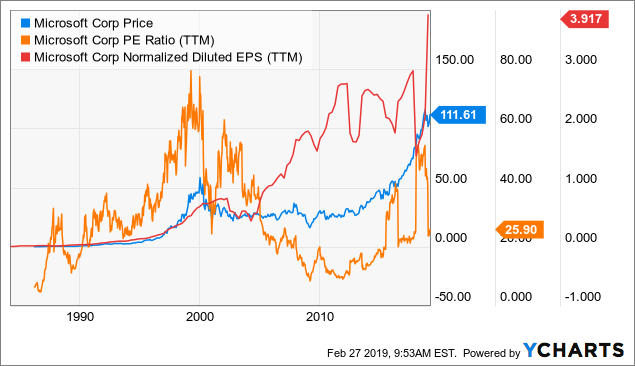 Let's look at the same chart with P/E as a measure of sentiment overlapped on top of the price and earnings. But let's look at what caused this high sentiment. Now, the worst has happened. 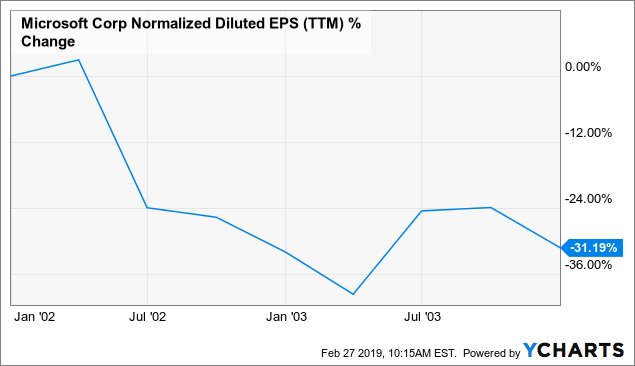 Not only have Microsoft's earnings slowed, but they have gone negative, falling around -15% per year for the next two years. So, we now have a situation where we had both a sentiment and an earnings-driven super-cycle for the company. And it would take the stock about 15 years to recover those old 2000 highs again. Keep in mind, these are the stocks of great companies that have, or likely will, eventually recover. Many stocks that are in a super-cycle - even a smaller super-cycle - never come close to their reaching old highs again. 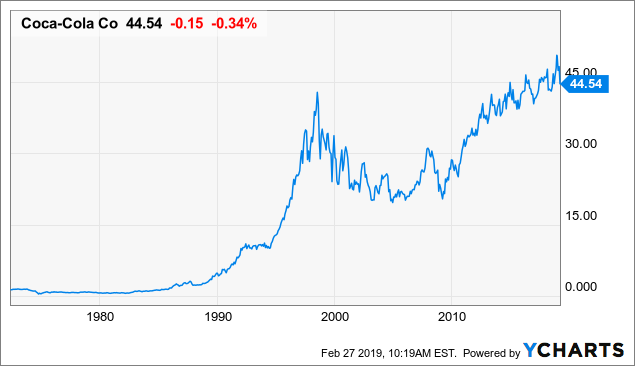 You can almost draw a perfect line from about 1995 or 1996, when a value or GARP investor should have sold Intel, to the bottom of the recession in 2009, when it would have been okay to buy Intel again using the log-scale chart. All those years in between were the rise and fall of Intel's super-cycle. Usually, super-cycles are not this obvious to see. One I came across lately because it was well off its highs and I was looking to potentially buy it was L-Brands (LB). Using a log-scale chart, really any bump to the upside that goes beyond previous trends should raise suspicions of a super-cycle, and we see it in the chart above pretty clearly in 2014 and 2015 with L-Brands. At the very least, it should raise one's suspicions enough to look closer. F.A.S.T. 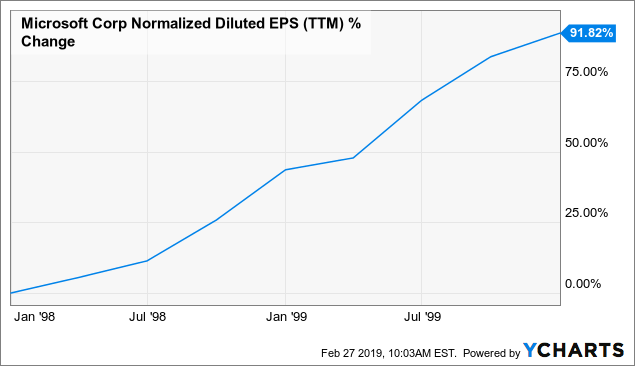 Graphs are a great way to gain super-cycle information as well, especially for companies whose earnings haven't been especially cyclical in the past. Notice the huge distance between the black line (price) and the earnings (dark green shaded area) in 2014 and 2015. That is quite often a good sign of a super-cycle. 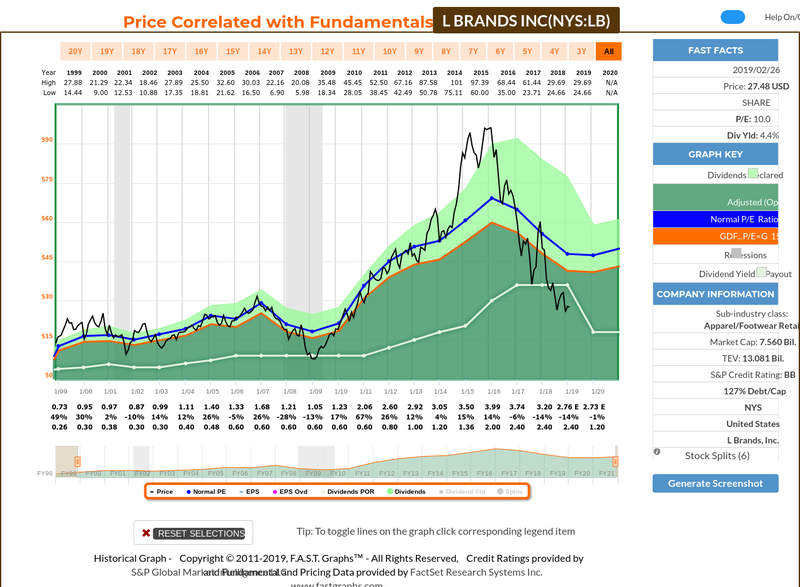 L-Brands is currently down about -69% off its super-cyclical highs. Suffering even half of that decline is certainly something I want to avoid. Identifying super-cycles is especially important for my investing style because I typically decide where I would like to buy stocks by measuring how far they have fallen off their peaks. 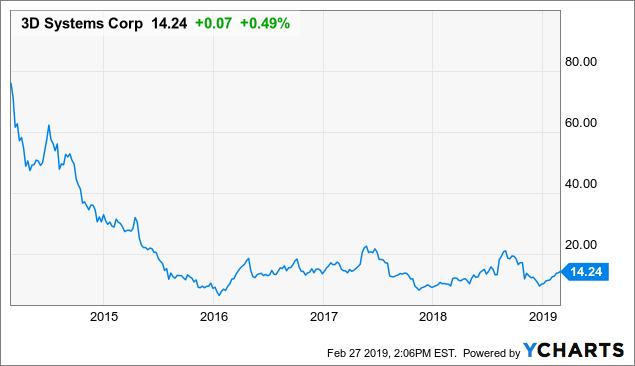 That doesn't work if the stock has just come off a recent super-cycle, and it can cost me a lot of money if I don't properly identify them, because I'll be buying too soon, while the stock still has a long way to fall. There are at least three different types of super-cycles I deal with on a semi-regular basis. 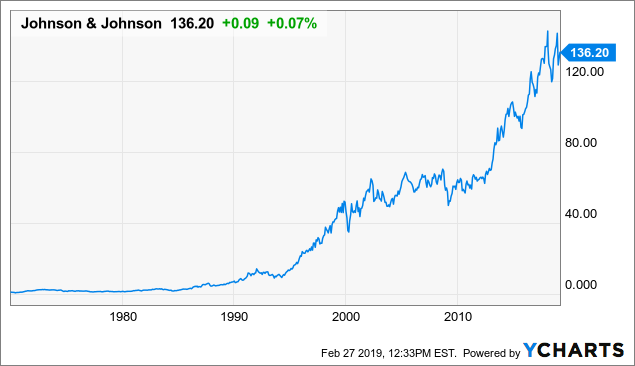 First, there are those, like Microsoft in 2000, that are still in a long-term secular growth phase of their business and whose earnings aren't any more cyclical than the wider market. In cases like these, I think it's okay to buy the stocks based on whatever their earnings-based fair value is. 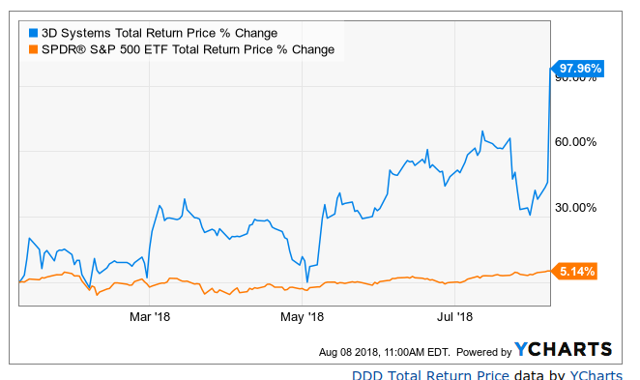 In order to keep things simple, I'm going assume a long-term fair-value P/E for Microsoft would be that of the market, which is 15 (represented by the orange line on the graph). 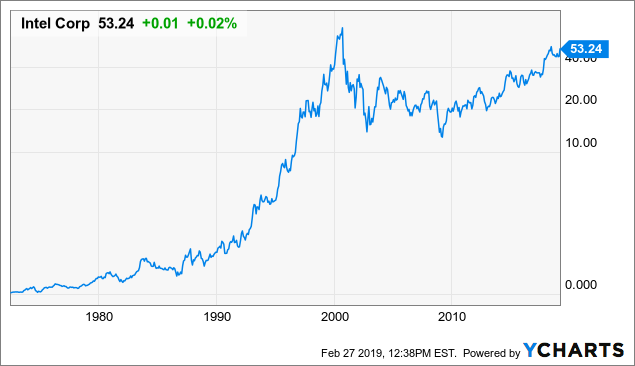 So, working our way through time from the year 2000 toward the right, Microsoft's price crossed that line in mid-2008, and it would have been okay to start buying the stock at that point in time, which was about 8 years after its super-cyclical peak. 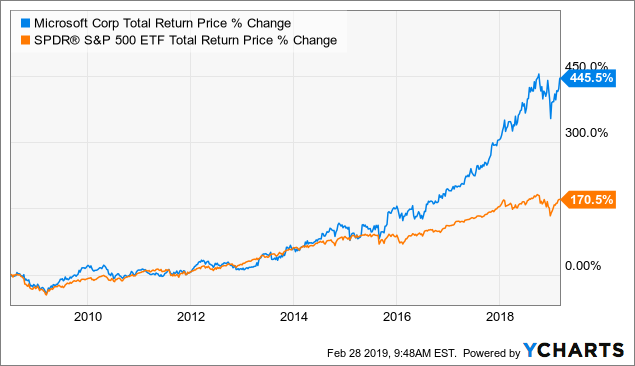 Doing so, one would at least have achieved market-matching performance for the next several years until Microsoft broke out to the upside around 2015. The next type of super-cycles are ones in which an already cyclical stock has a big earnings-driven cycle. 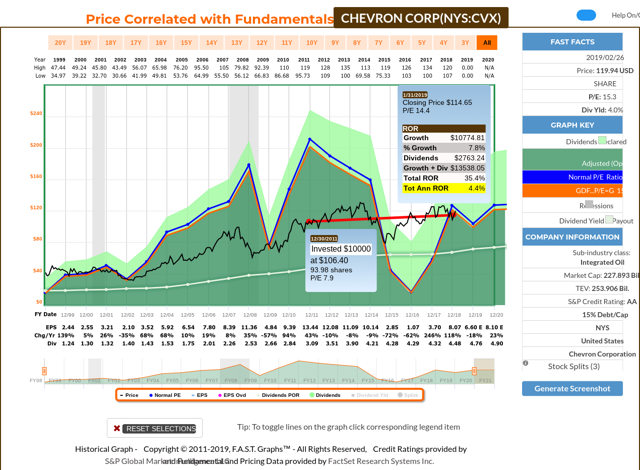 That was the case with Chevron (CVX) at the beginning of 2011. 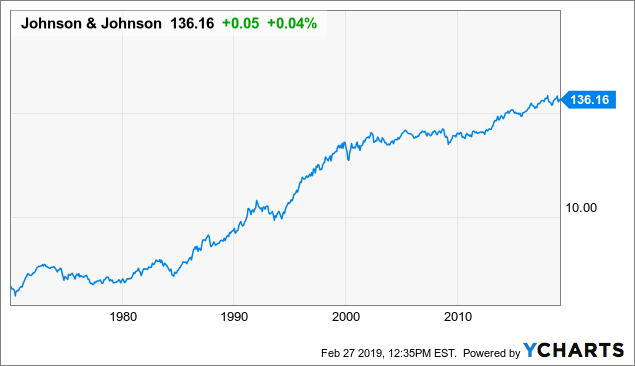 At that time, the company's P/E was only 7.9, quite the opposite of Microsoft's late 1990s 80 P/E. But with Chevron, it wasn't the price of the stock and the sentiment that was cyclical, it was the earnings. The high price of crude oil and gasoline had provided an earnings super-cycle, and by 2016, those earnings would fall by around 90% from their peak. And over the next 7 years, from 2011 to 2018, including dividends, Chevron would only return 4.4% per year. With these sorts of cycles, one probably needs to go back to a super-cycle in the past and use that as a potential guide for what to expect in the future, comparing previous super-cycles with normal historical price cyclicality, or trying to parse out what is sentiment from actual earnings-driven valuation. 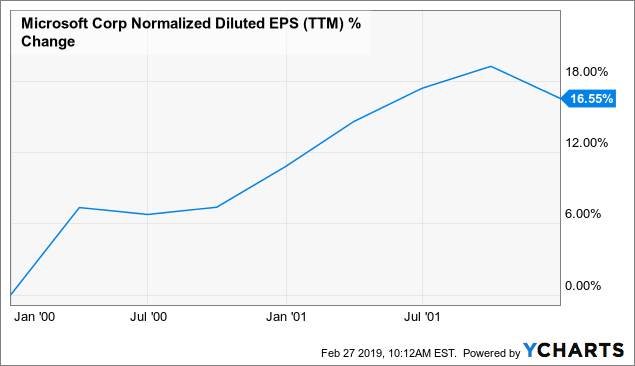 It's pretty tough to do if one can't find a clear example from the past, so I tend to avoid these unless they get ridiculously cheap, where any movement in earnings or sentiment could cause the stock to rise. I recently attempted to do that with Schlumberger (SLB), and time will tell how it works out, but it's not an easy task. The last type of super-cycle is for companies that don't have much in the way of earnings, but occasionally have sentiment drive cycles. In 2018, I wrote about, and made about a 97% profit in 8 months on, 3D Systems (DDD) by investing post super-cycle. For these stocks, I look for a pretty clear double bottom in the price of the stock and take profits before it reaches the peak of the bounce in between the two bottoms. Once we got close to what I considered fair value, I took profits. I continue to do more research on super-cycles, but I think this article should act as a reasonably good primer for how to identify some of them quickly and some basic strategies for how to potentially profit from them. 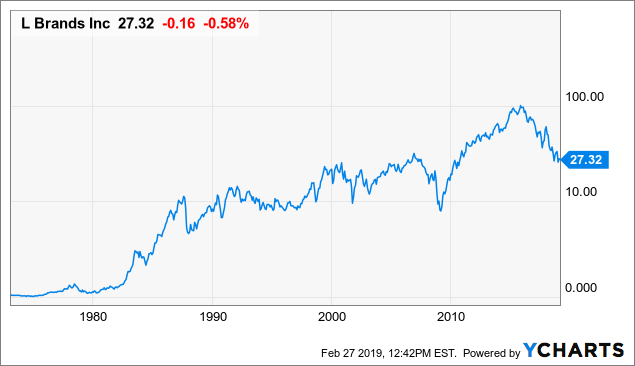 At the very least, I check every potential investment to make sure the stock hasn't recently experienced a super-cycle, because super-cycles (or any kind of boom, bubble, etc.) have the potential to throw my valuation process off. I suspect they could do the same for investors using other valuation processes as well. I have several future articles like this one planned for 2019. If you would like to be notified when I publish those articles, click the orange "Follow" button at the top of the page. If you have found my strategies interesting, useful, or profitable, consider supporting my continued research by joining the Cyclical Investor's Club. It's only $29/month, and it's where I share my latest research and exclusive small-and-midcap ideas. Two-week trials are free. Disclosure: I am/we are long SLB. I wrote this article myself, and it expresses my own opinions. I am not receiving compensation for it (other than from Seeking Alpha). I have no business relationship with any company whose stock is mentioned in this article.